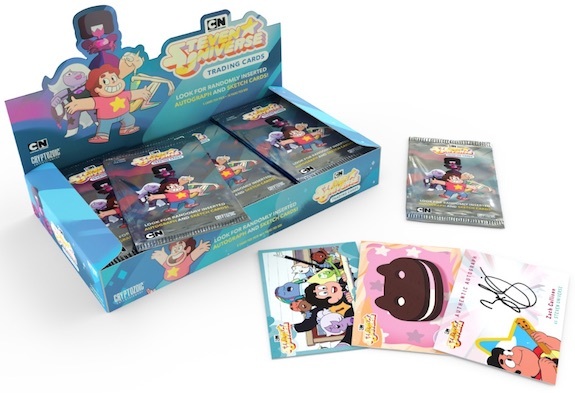 2019 Cryptozoic Steven Universe covers the Cartoon Network series with a full trading card release. Each Hobby box is expected to have one autograph from a voice cast member and a hand-drawn sketch card. The set takes collectors to a fictional world where Steven Universe (Zach Callison) lives with the magical Crystal Gems aliens in Beach City. In fact, Steven is half-Gem himself. 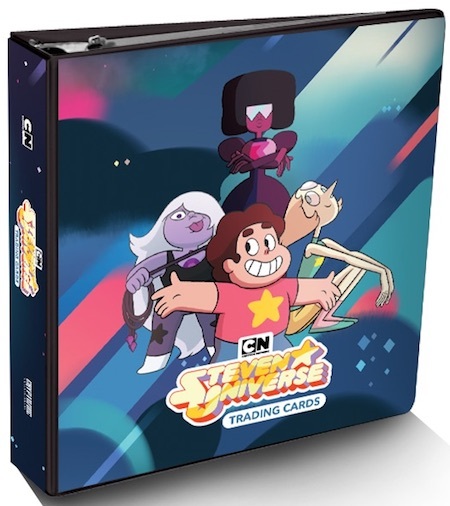 Recounting the animated series that debuted in 2013, the 2019 Cryptozoic Steven Universe checklist offers 72 base cards with images from various episodes. Chase inserts include Crystal Gem Friends, Dazzling Diamonds, Fusions, Greatest Hits, Scratch and Sniff, and Stickers. The base cards and select inserts also have foil parallels and one-of-one printing plates. A normal component of Cryptozoic sets, those that want to add a little extra to their collection can purchase the separate binder album to store and display the cards. Delivering a premium element, 2019 Cryptozoic Steven Universe works in autographs and sketch cards at an average rate of 1:24 packs each. The Autograph cards come from main characters and guest stars that provide the voices in the series. Although there was not any specific mention of the confirmed signers, the early image below shows an autographed card for Zach Callison as Steven Universe. Sketch cards are naturally artistic interpretations featuring key subjects from the show. Steven Universe finished its fifth season in January 2019 with a Cartoon Network movie planned for later in 2019. If you want even more to collect, there is a Funko Pop Steven Universe vinyl line. The full checklist will be added as soon as it is available.